Food Network's Claire Robinson is excited to announce that starting Monday, August 27, amateur chefs and kitchen mavens can download a FREE digital cookbook featuring five new original recipes from the five ingredient chef herself! Claire recently teamed up with Coffee-mate Natural Bliss to host a national Facebook contest and Nashville’s April McKinney and her Peachy Bliss Bread Pudding recipe (below) won! The contest, which ran from May 23 – June 25, asked participants to create an original recipe and film a cooking demonstration for Facebook. Contestants baked and battled for the chance to win an all-expense paid trip to New York City to meet and cook with Claire, and appear on a Better TV segment. After dozens of entries, only 10 lucky fans were selected to have their winning recipe published in a limited edition cookbook, alongside Claire and April’s recipes. To download the full cookbook, log on to the Coffee-mate Natural Bliss Facebook page starting August 27: www.facebook.com/CoffeemateNaturalBliss. - Combine biscuits, peaches and pecans in a large bowl; place in 9-inch-square baking dish. - Whisk together 1-1/2 cups Coffee-mate Natural Bliss, eggs, 1/4 cup brown sugar, vanilla extract and 1/2 teaspoon salt in large bowl. - Pour cream mixture over biscuit mixture; let sit for 10 minutes. - Bake for 40 minutes or until set. Cool for 10 minutes. - Whisk together remaining 1/2 cup brown sugar, butter and remaining 1/4 cup Natural Bliss in a small saucepan; cook over medium-low heat, stirring frequently, for 3 to 4 minutes or until smooth and creamy. Remove from heat; add white chocolate and remaining 1/2 teaspoon salt. Whisk until chocolate melts. 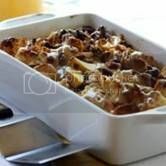 - Serve sauce over warm bread pudding.